Philadelphia Market East Station. Photo Credit: Flickr/acetonicThis post is part of a series called North America’s Train Stations: What Makes Them Sustainable — or Not? See the series introduction for more. In the series introduction, I divided America’s stations into four categories based on how they are evolving to sustainability. The first was “The Likely Sustainables.” While most cities have plans to reutilize their central station, these cities are doing it best. These stations serve compact cities and are using these economic advantages to help their transit system achieve fiscal sustainability over time. How we define “fiscal sustainability” ultimately depends on taxpayers; since it is their subsidy that makes it possible for the systems to run. But for the purposes of this series on train stations, fiscal sustainability means that a particular central station has led its transit system on to a path that can reverse the four decade trend of rails requiring ever more public subsidy. According to this series’ current scorecards and analyses, there are five to seven stations in this category and most will be described during the balance of 2013. For today, The Sustainables are represented in this post by an analysis of how through-routing connects Philadelphia’s three downtown stations. Summary: For transit towns struggling to improve their network, Philadelphia teaches them that through-routing helps make most things better. 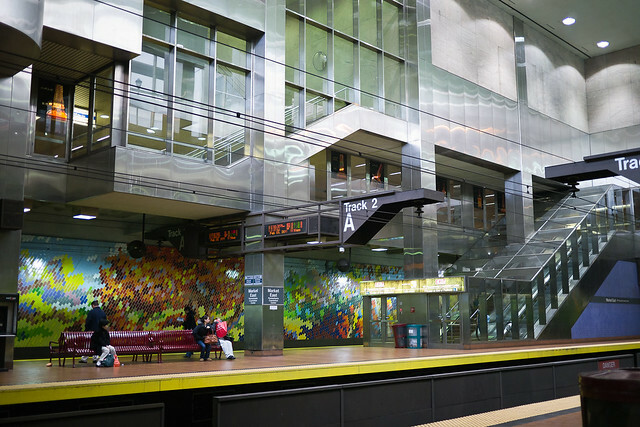 Connecting the legacy lines of Philly’s two main commuter rail companies has increased ridership and helped improve downtown real estate. If boosters of other cities cry “unfair advantage” because Philly gets evaluated with three connected stations instead of just one, my response is: connectivity is the key to sustainable stations and its subtleties create special rewards. Three commuter rail stations connected by the dashed horizontal black line that runs one block above the main subway, the blue line.A useful theory to test is whether Philly’s transit innovation has been fostered by good urban bones. Starting with the 18th Century walkable grid laid out by William Penn, this narrow land between two rivers — called Center City — prospered using boats, the young nation’s first mode of transportation. The grid also helped the next mode as it helped Philly develop more densely around rail stations. Eager to spread this new mode to outlying areas, Center City annexed the rest of Philadelphia County before the Civil War. Philly’s foresight gave it a three decade lead before annexation sprees in New York and Chicago caught up. Also, Philly’s suburban rail consolidation seems pioneering: with the Pennsylvania RR (Pennsy) and its rival Reading RR overtaking their competitors before other cities’ rails did. With only two spheres to consolidate in the 1980s, SEPTA’s takeover emerged better. But Philly’s lead truly widened with the first through-routing of a major U.S. metropolitan commuter system. In October 1984, the Center City Connection opened, a commuter tunnel connecting the Reading stub terminal to the Pennsy system. Simultaneously, the new system converted from dirty diesel to quiet electric, though at the loss of some diesel lines. As recognition of this strategic investment, The American Society of Civil Engineers could barely wait for early results and, in 1985, gave this tunnel its top infrastructure award. Since making this investment to integrate into one system, the tunnel’s impact clearly is positive. 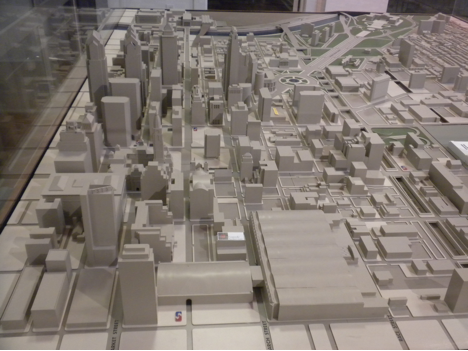 Center City’s residential population has grown by over 50%: making it the third most populous downtown in the U.S. (Most residential is not shown on the model below because it is on the left of this westward view of the model.) Also, Center City employment numbers have rebounded and compete better with suburban job creation. 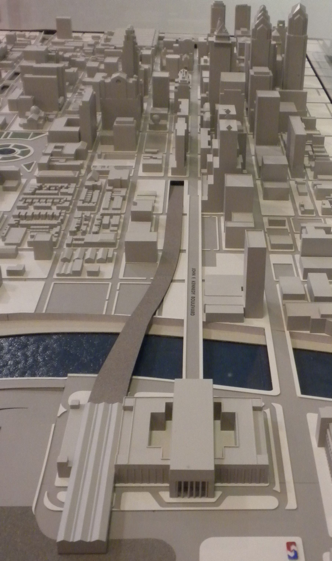 This model looking straight up Philly’s transit corridor shows centuries of integrated planning. From Market East station in the middle foreground (next to SEPTA’s red-blue logo); then carry your eye up the street to the next logo (on Love Park in front of Suburban Station); then cross the river to the monumental 30th Street Station. Completing this tight transit corridor, the main street running just to the left is Market and has street cars and a subway. And what are the economics of this corridor? Philadelphia Suburban Station. Photo Credit: Flickr/ireneilleeReal estate values around Suburban terminal have improved consistently since it became a through station. 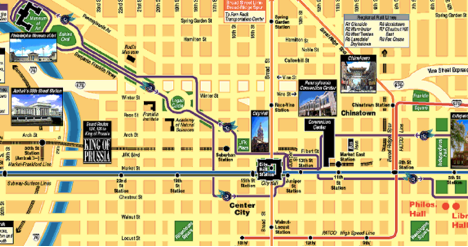 Tied together with underground passages to the station, there are 11 buildings of Penn Center, plus Comcast Center. Together, they average 33 stories. Since the 1980s, 86 stories have been fully renovated equalling those un-renovated stories built in the 1960s (50 years is a normal life-cycle before a major renovation.) Over 164 stories have been built anew in Penn Center. In 2006, the redesign of the centerpiece Suburban Station was completed; improving HVAC, waiting areas, retail, passenger flow and the 20 commercial stories above (called 1 Penn Center)… all earning it an Energy Star rating. Only one-half mile from Suburban Station (but a world away from office work), the former Reading Terminal has been redeveloped as the main Exhibition Hall of the Pennsylvania Convention Center. A touristy, mid-scale mall of almost 120 stores, called The Gallery, adjoins the new Market East Station at the end of the commuter tunnel. After suffering decades of disinvestment, this area also has benefitted greatly from the 1984 through-routing. The Convention Center successfully got through most of its second phase expansion despite a deep real estate recession. The Gallery has stabilized through the upheavals in retail anchors and the station’s overall success has given Amtrak reason to consider it as its preferred stop for high-speed rail. Making greater passenger convenience, the Commuter Tunnel integrates the former Reading (5 lines) and Pennsy (8 lines) to bring customers directly to each others’ stations without the hassle and cost of transferring. Through-routing clearly contributes to sustainable downtown redevelopment around these three stations. Rounding-out the trio… One mile west of Suburban is the model of how to honor rail’s past and invent the future. Unlike many other cities, Philly kept its jewel, Penn Station. Finished in 1933 by Burnham’s successor firm, Penn Station’s grand neoclassical exterior blends well with an exquisite art moderne interior with aesthetics reflecting Philly’s transit innovations. 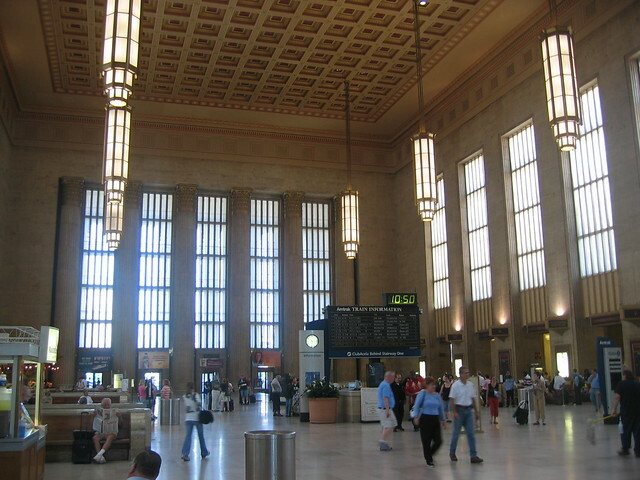 Owned by Amtrak, it was renamed as 30th Street Station. But its owner has kept every bit of the original grandeur; making it a joy to visit and even relax. Philadelphia 30th St. Station. Photo Credit: Flickr/afagen As grand and gorgeous as this station is, real estate redevelopment along the Center City mile between 30th and Suburban stations has improved dramatically since through-routing. Looking on this model from 30th Street towards the CBD, south of the tracks now has 60% more floor space than 30 years ago and nearly all of it is updated or new. North of the tracks, more than half of the buildings have been renovated. An urban wasteland also has been transformed on 30th Street side of the river. The sleek, glass tower to the Station’s right (in the photo) is The Cira Centre — also designed by a star architect’s firm (albeit 100 years later than Burnham). The 29 story tower now serves as commercial anchor to the area; built above an ugly railyard that many earlier proposals had failed to conquer. A more sprawled anchor is nearby University City; hosting campuses for Drexel and Pennsylvania universities and Philly’s largest medical center. This area was in particularly bad shape thirty years ago. Fit all this into the big picture and Philly is relatively more transit-friendly than its larger rival, Chicago, which has similar per capita transit usage but no commuter through-routing. 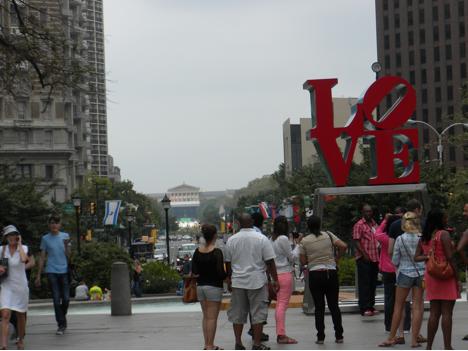 Suburban Station borders Love Park, where young and old lovers come to encourage their relationship and be photographed under the iconic LOVE sign. Since Suburban is has the greatest traffic, the Park also has a Visitor Center that looks up the diagonal of the Ben Franklin Pedestrian Mall and museum campus; somehow capturing urbanity’s best. As I walked through at lunch hour, a rapper in the Visitor Center bandshell was singing about his struggles with and love for his father. When I absorbed all this and entered the best commuter station I have ever seen, the uplift was too multiple and I wiped my watery eye. SEPTA has been better than most region’s agencies at integrating commuter rail well with subway, light rail and busses. SEPTA even has revived trolley lines. A key example for the entire system is these modes integrate tightly within a block of these three stations. Despite accolades from me and others, SEPTA still can improve on the road to fiscal sustainability by increasing ridership and lowering costs. Criticized in this “Transport Politic” post, SEPTA is not doing the simple, inexpensive innovations such as clearer map and signage that highlights the advantages of through-service. Also in SEPTA’s takeover from Reading and Pennsy over three decades ago, a bruising strike derailed an opportunity to bring commuter-rail up to rapid-transit labor efficiency standards. Instead, SEPTA has adjusted to fiscal realties by reducing services; and in other ways, doing little to contain the cost side of the equation. As for Philly’s future transit improvements, refer to this “TP” post. While the proposed innovations focus on Center City and giving the public the most bang-for-their-bucks, some proposals seem suitable as Public-Private Partnerships. But PPPs still will require new public dollars. As a funding innovation, targeted special transit assessments in Center City might be worth a try for specific projects that show quick results. Actually, those three outer diesel lines (former RDG to Reading, Newtown, and Bethlehem) were the only diesel routes left in the SEPTA system by the mid-1960s; the current electric network sans the Airport Line was mostly fleshed out sometime in the 1930s. The opening of the Commuter Tunnel really meant that the diesel lines, shut down two years prior, had no chance of returning because of lack of proper ventilation in the tunnel. Now, this is rather shortsighted on SEPTA’s part because it makes the long-awaited restoration of the defunct lines that more difficult. While Amtrak officially designated it as 30th Street Station, locals always referred to it as 30th Street Station to differentiate it from the other Penn Station, the former massive Broad Street Station. While through-routing had its greatest benefit in stringing the several Center City stations, the secondary purpose was to bring S-Bahn/RER style operation to Philadelphia, connecting Reading lines to PRR lines in one ride via the infamous R# naming convention (R1, R2). This was not carried out as ideally as it should, as the final plan was modified from Vukan Vuchic’s original plan to connect lines of similar ridership due to cost constraints. Not all trains stayed on their line; the R number was sometimes switched at Suburban. SEPTA ultimately dropped the R# in 2010, but the trains still mostly through-run as they did formerly. Finally, we have to credit the Pennsylvania Railroad for starting this pathway, as they took initiative to move away from the hugely inefficient Broad Street terminal and adapt a) 30th Street to tightly integrate 4-direction intercity and commuter operation and b) Penn Center/Suburban Station as direct access to the CBD. As much as the Gallery is a failing mall now, mayor Dilworth and planner Ed Bacon should also be commended for integrating SEPTA as the lifeblood of this retail center. As early as the 1950s leaders had the idea to connect Reading and Pennsy, and 30 years later the project was authorized in the nick of time, before Reagan’s transit cuts. Thanks particularly for your insights on the diesel/electric conversion. I wish I had known about you as a source and reviewer before posting. Both Aaron and I were greatly impressed by your city and were in a hurry to tell the transit rendition of the Philadelphia Story! The problem with the Regional Rail system is that unlike S-Bahns or the Paris RER, it’s still run separately from urban transit. When SEPTA tried to integrate operations, the railroad workers went on strike. The fares are not integrated: you have to pay a separate fare if you want to transfer from Regional Rail to the subway. The variable operating costs remain high, so off-peak frequency is still pitiful. There is no integration with rail lines in Jersey except in the Trenton direction, which leads to an awkward shape for most of the old R# lines; even though there are tracks on the bridge to Camden, they’re used by PATCO with horrific integration with Regional Rail instead of connecting to Market East and running through. Because the fares and the schedules are so inconvenient, city passengers don’t use the system if they have alternatives. As a result, the stop spacing in the city is very sparse, and the lines contained entirely within the city underperform. Philadelphia looks superficially like an RER, but misses a lot of the features that made it such a success. As a longtime SEPTA rider, both regional rail in my youth and buses, trolleys and subways as an adult, it can be easy to point to SEPTA’s flaws. We would all like to see tracking of bus and subway arrival time, cleaner stations and cars, etc. But SEPTA has always gotten me where I need to go, has courteous staff and great coverage (if you overcome the rampant anti-bus snobbery), and has been reinvesting in stations throughout the system — a benefit for riders and non-riders both. I am hopeful that their (much delayed) modern fare collection system and maybe some fresh graphic design will be all it takes to make riding public transportation a standard “adventure” for tourists and an ever-easier addition to the day of area residents. It’s wonderful to see our system though an outsiders’ eyes — thanks for reminding me just how good we have it! Interesting analysis comparing bus rapid transit with light rail, just released. You have to scroll down the article to get to the pdf. Correction: West Philadelphia/University City is home to Penn and Drexel, not Temple. My apologies to Drexel for my temporary discombobulation. Taken from the 30th Street platform, I even have a memorable photo of Drexel’s “Thinking Forward” billboard on its building as the SEPTA train rolled in. I knew about the study because it is often quoted. Last year Chicagoans heard BRT presentations from a top Cleveland transit official about their Healthline. Thanks for sharing. I think an important difference between SEPTA and Chicagoland’s RTA is that one agency actually has the authority to do something about complaints… Also, SEPTA is expected to be proactive. As for your other comments… I think your city’s charm is its quiet self-confidence which, I have to say, is refreshing when I compare it to my city’s boosterism which has for too long covered its transit flaws. I agree with everything you said. My point was that SEPTA had a chance to get near the European standard; which you set at RER… which is at the top. I was thinking SEPTA more had a chance to be like, say, Lisbon’s commuter system. I didn’t study PATCO; in part because I suspected its problems were what you said. We clearly need true regional authorities that transcend state lines; starting with NYC and Philly. I also would like your feedback on the scorecard. It is a prototype and needs to be simplified for stations after the first four articles in the series. Can you give me your feedback after the Chicago Union Station scorecard and article comes out next week? That way you can compare it to the Philly scorecard for accuracy. I think SEPTA would very much like the Regional Rail system to rival RER or a good S-Bahn. Unfortunately, they have to overcome a number of challenges to do so. First and foremost is funding. Harrisburg has a frosty relationship with southeastern PA, and takes a “starve the beast” approach in budgets. SEPTA receives less than half the funding of any major US transit system, yet provides service that rivals far better funded cities. But since the tunnel, they’ve never gotten enough funding to do more than maintain and replace a fraction of what they need to, expansion is an impossibility. To grow into an RER, they would need substantially more railcars and significant modernisation of every route, most of the system is basically a state of the art 1930s railroad, and many stations are little more than paved pads with bus shelters, high platforms are rare and ticket windows are rarer. Another challenge is the labor situation. When SEPTA took over the rails, the union went on a disastrous strike. When SEPTA experimented with running diesel shuttles to maintain non-electrified routes, they fought it. When SEPTA wanted to create a very RER-esque service restoration to Reading, it was just another example of “trying to run a railroad like a bus line” to the union. (SEPTA’s Schuylkill Valley Metro plan was flawed, mostly due to a lack of an FRA ridership model for high frequency suburban rail). Another challenge is that Philadelphia’s rail advocates are driven more by nostalgia than by mobility. They bite hard on the “buses on rails” stigma of a combined regional agency, and heavily criticise attempts to modernise the rails. Their priority is not higher frequency or high level platforms or logical line pairings; no, their highest priority is SEPTA’s lack of bathrooms, and providing diesel hauled coaches to outlying exurbs. Alon is fairly on-point about SEPTA’s lack of fair logic. A great example of this is the route 23 bus, which runs roughly halfway between the two Chestnut Hill rail lines, and yet has higher ridership than either. For many riders, a cheaper fare is worth the hassle of transferring to the subway. While PATCO’s connection to Market East is not great, I don’t know if I’d go so far as to call it “horrific”. It’s 2 blocks of underground concourse, about 400 meters. It’s not that much longer than the distance between the el and the regional rail at 30th Street, or between Penn Station and Herald Square in New York, both of which require going to street level. In the long run, a New Jersey regional rail system should make a much better connection, but it could be a lot worse. Thanks for the great Comment. I defer to your judgments. Already with overly-long articles, this is a series about how central stations support a transit system. System flaws are far more numerous and serious and probably correlate to an inadequate station, although the evidence is not yet in… or at least not organized into articles. When I get around to writing a series on transit systems, can you be my source for Philadelphia? I did get off on a bit of a rant there. I think the key point is that SEPTA’s quality central stations are held back by the overall underdevelopment of the system. I just caught a train out of Market East yesterday, and it was disappointing to see so few trains passing through a major central station. It should have much higher frequency on the regional lines, and with some upgraded connections could easily serve intercity trains as well. It also is very hard for me to draw the line between the central station-as-symbol-for-the-system and the flaws of the system itself.